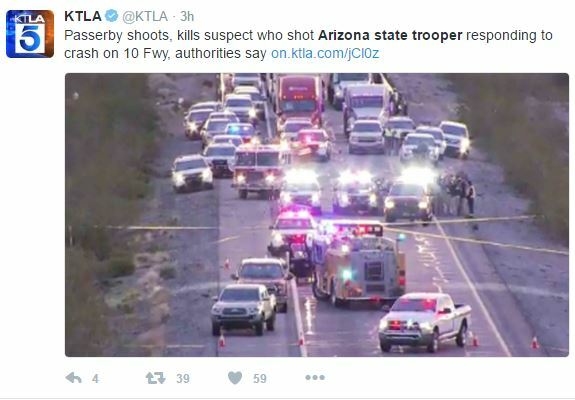 An Arizona State Trooper was unexpectedly “ambushed and shot” while responding to a car accident Thursday morning. He was saved by an armed passerby, according to the Arizona Department of Public Safety. The ADPS confirmed that the unidentified trooper was shot in the chest before being transported to a local hospital in stable condition. Several troopers were responding to a call of shots being fired along the westbound roadway of 1-10 near the Tonopah, AZ at approximately 4 a.m. local time. One of the troopers, the 27-year veteran who was later shot by the suspect, stopped near milepost 89 to assist a woman that was ejected from her vehicle as it rolled over off the highway. The trooper started blocking off lanes when he was attacked. Col. Frank Milstead told reporters that the gunman shot the trooper in the chest before wrestling him to the ground. A citizen that was driving by stopped to assist the officer. The person retrieved a gun from his car and fatally shot the suspect, according to Milstead. Milstead offered an official “thank you” to the passerby. “Because I don’t know if my trooper would be alive today without your assistance,” he said. The officer is in stable condition and awaiting surgery. The female passenger of the rolled over vehicle was pronounced dead on the scene. Officials have also confirmed that the suspect is deceased.